Life With the Ladniers: Plant A Tree. Or Three! David and our dad's planted our Christmas trees today! 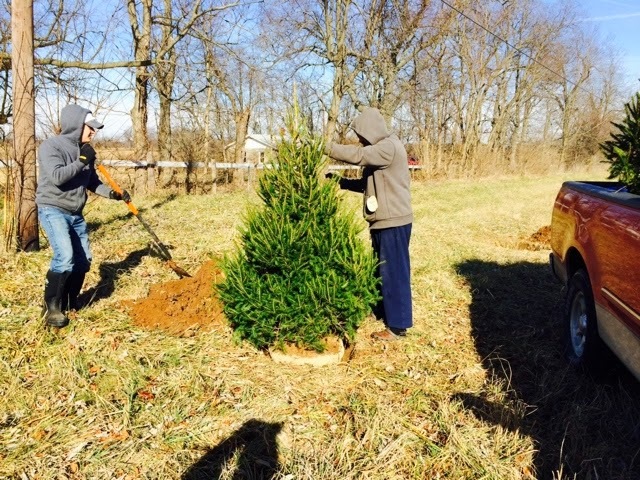 We have officially begun our own tradition of planting live Christmas trees every year and both sets of our parents donated their trees for the cause. Ayden helped us take the decorations off of our tree to get it ready for planting and everything. He loves being involved in whatever we are doing for sure! Our home place is slowly beginning to look like home. All we need is to replace the stakes and strings with our very own little cottage! Today's Project Simplify 365 task: I had some full, travel jewelry cases from the passed couple of trips I took sitting on the dresser next to my jewelry box for weeks. I finally emptied them all and put everything in its place. Every time I passed them I thought about how I needed to do that. I was getting tired of seeing the clutter on our dresser! It feels so go to have crossed it off the list. Just one tiny thing a day yet I can really feel the progress. If you are feeling like you need some motivation to purge, organize or otherwise simplify your life, I'd highly recommend starting your own Project Simplify 365 challenge! Flashback! Here's what we were up to one year ago today: "Moving Forward"